I grew up in the rural farmlands of western Massachusetts. Starting in elementary school when my recess air always smelled like manure, to the middle school science projects where we would walk 5 minutes up a road to study the process of milking cows, to high school volunteer work based in weeding gardens, I’ve always been a country girl at heart. Spending my post-collegiate years in larger cities has been a nice change, feeling concrete under my feet rather than grass or dirt, smelling garbage trucks rather than fresh flowers. (Seriously, though, I’m pretty happy to live in a place where I can walk/bus/metro from place to place rather than drive!) So recently, when Pleasant Pops was offered the opportunity to join a few other DC companies in taking a tour of Trickling Springs Creamery, everyone’s favorite dairy spot, I was totally on board. Not just for the pleasure of learning how whole milk is churned into butter or recycled glass bottles are cleaned and re-filled, but to get my feet a little dirty, my lungs a little full of manure-air, and my heart a little taste of home. 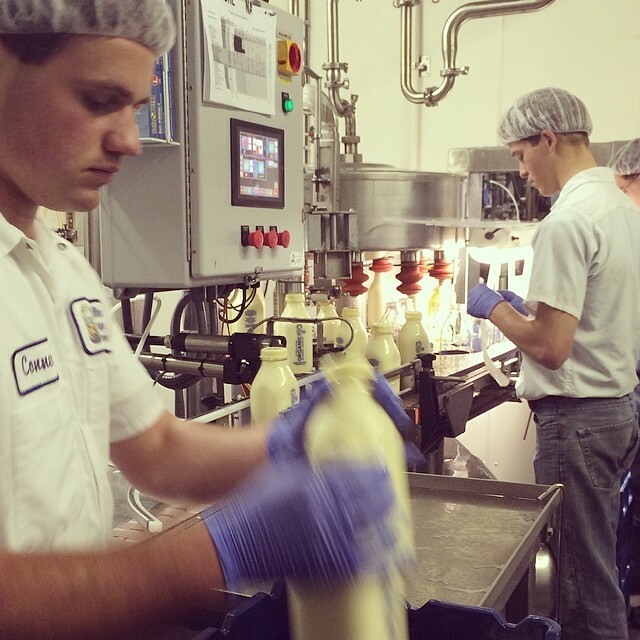 The first part of the tour was at the Tricking Springs Creamery in Chambersburg, Pennsylvania. We were greeted by many of the TSC team, including one of the owners, and given samples of their smoothies, dark chocolate milk and homemade cheese. Next, we were lead on a tour through the actual creamery where we saw the ins and outs of the Trickling Springs world: returned glass milk bottles being sanitized, stack and stacks of labels for each product they make, cookie dough bits being added by hand to the ice cream maker. We learned about the pros and cons of buttermilk and stood inside a refrigerator the size of a high school auditorium. It was clear each step of the way how much the Trickling Springs staff care about the quality of their products and the quality of their work life. And even though we looked pretty silly in our matching hair nets (no beard nets necessary), it was amazing to see the behind the scenes of such an operation. Next, we were driven a few miles away to Hamilton Heights farm, one of the many organic dairy farms Trickling Springs sources its milk from. The owner of Hamilton Heights, Cliff, greeted us with his wife and welcomed us onto their their beautiful, healthy and vibrant farmland. After walking through a barn where a dozen cows were being milked, we proceeded into one of the pastures where cows of all shapes and colors were grazing. 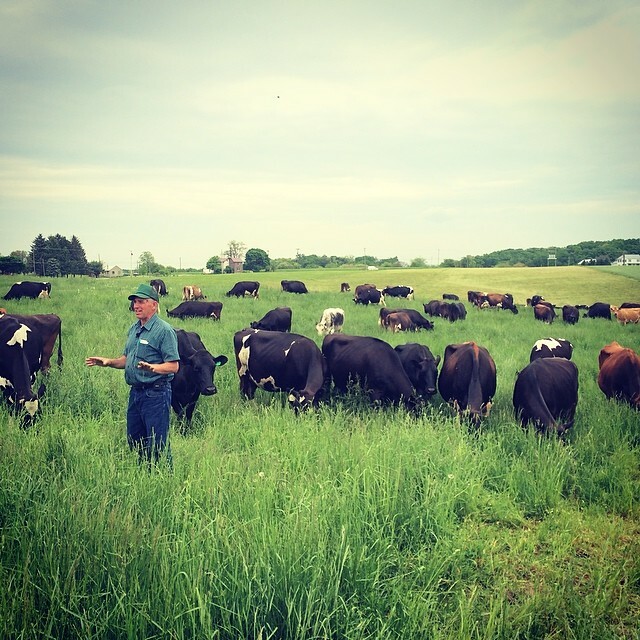 Cliff, as a sixth generation farmer, was completely comfortable standing among the cows, speaking from the field about what it means to be a certified organic farm, how the cows spend their days, and why soil and grass is just as important to the taste and quality of milk as anything else. It was inspiring, educational and a truly happy scene to be a part of. To pick only one highlight from our day at Trickling Springs would be impossible. Yes, the cone full of chocolate-cookie ice cream was spectacular. Sure, seeing the speckled cows nuzzling each other was adorable. And getting a sneak peak into the hilarious cartoons posted around the creamery, inside jokes among a friendly staff, was totally awesome. All in all, it has only made me feel more thrilled that Pleasant Pops carries and serves Trickling Springs products, knowing what a strong company we’re supporting. In fact, we’ve added a couple new products to our shelves (half liters of organic half & half and mango-peach yogurt smoothies). If you ever find yourself craving some fresh, perfectly manured air, feel the need for some dirt between your toes, and have a craving for some creamy scoops of ice cream, take a drive north to Trickling Springs Creamery and you will not be disappointed!